Ayub Ogada is a musician who draws inspiration from his life experiences and from the nature that surrounds him in his home in Kisumu, Kenya. He plays the traditional nyatiti, an eight-stringed lyre favoured by the Luo people of Western Kenya. In his music you will often hear the sounds of nature and people – the songs of birds, the calls of animals and the sounds of children playing. Many of the songs in his latest album, Kodhi, (meaning seed in Luo) were recorded outside to capture these authentic sounds. 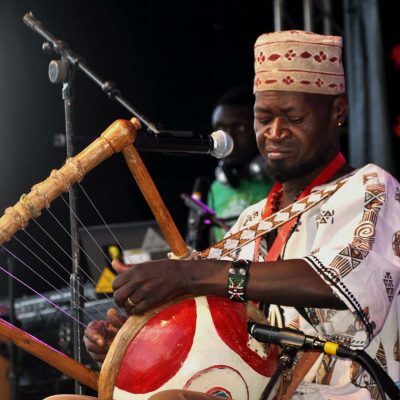 Ayub Ogada has performed numerous large festivals and concerts including WOMAD, the Live 8 concert and the Eden Project. Ayub Ogada has also acted in major films including Out of Africa (1985) and The Kitchen Toto (1987).